PeacockMedia: How do LIFXstyle and Hue-topia look when built to run on the new dark mode? 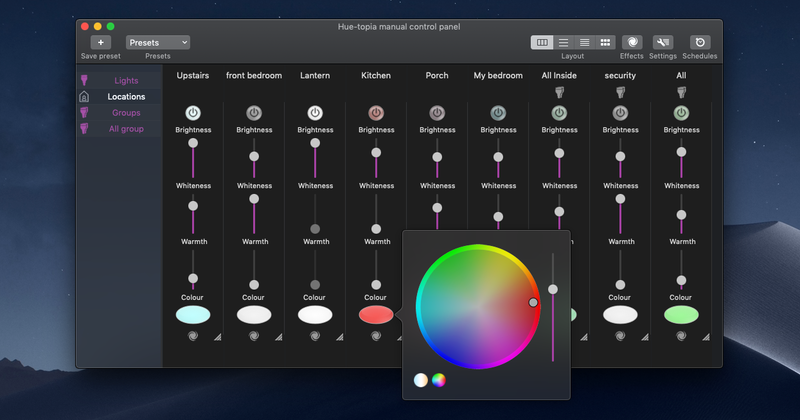 How do LIFXstyle and Hue-topia look when built to run on the new dark mode? I'm really chuffed with this, in fact I'm increasingly pleased with dark mode, it's really easy on the eye and Apple have done a great job. If I had applications that really needed dark mode then it's my lighting controllers Hue-topia and LIFXstyle. The last thing you want when you're adjusting mood lighting is a bright laptop screen illuminating the room. The new versions with dark mode enabled will be ready before too long. Does it take much work to ensure your application works correctly in this mode? But certain components (table or field backgrounds for example) may have their colours hard-coded, and these need changing to use one of a set of special system 'colours' which change according to the user's system preferences. If there are icons or graphics used within the app then these need checking to see whether they look crap against dark mode. Sometimes it's necessary to make two (or more) versions of a graphic which will switch according to the screen mode and other options (eg high-contrast mode). This assumes that you want to go with the user's system preference for light or dark. There are other options, such as forcing one or the other (dark for the window border / controls with light content, for a creative app) or allowing the user a preference of light / dark for the app, independent of the system preference. Some of my apps have required little work, others (older ones) have taken more. But It's all good. Dark mode is a real plus for the system and my apps.